$ 25.00 - "SOLD" - THANK YOU !!!! 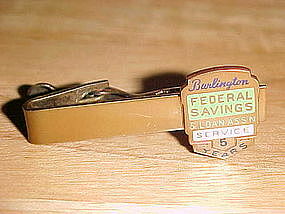 Nice 1970's salesmans tie clip from SNAP-ON tools. This tie bar features a rachet wrench and the name Snap-on. It is in fine condition and measures 2 1/4" wide. A great gift for your beloved Mechanic or Tool enthusiast!!! Vintage Mens cufflinks and tie bar. This set features a Steam Engine from the B & O Railroad. This set faces are enameled. The set is in good condition with the tie bar having some small enamel loss and the cufflinks have a few tiny stress cracks. 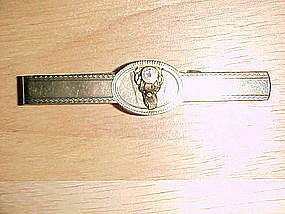 The tie bar measures 1 7/16" wide and 3/4" high. Each tie clip is 1" wide. 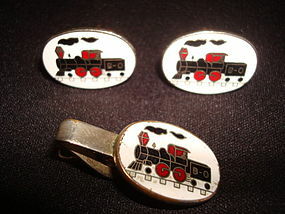 Dispite the minor defects, this is still a nice collectible Railroad set and will look great being worn by a Railroad Buff!!! $ 65.00 - "SOLD" - THANK YOU!! Super ANSON tie clip and cufflinks set. 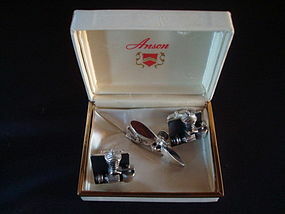 This vintage set consist of two cufflinks, each featuring a part of a Airplane Engine for their design, the tie clip features a Airplane propeller and a small engine section. They are in very fine condition and come with their original box!!! Each of the three pieces is signed ANSON. The tie clip measures 1 7/8" wide and the cufflinks measures 15/16" square. A most unusual ANSON SET!!! 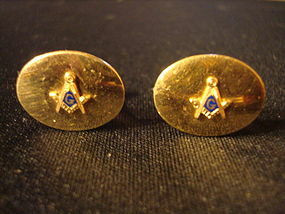 Nice vintage pair of oval shaped gold filled cufflinks each baring the symbol of Freemasonry. Each cufflinks face is 7/8" wide and 5/8" high. They are in fine condition with usual tiny surface scratches. 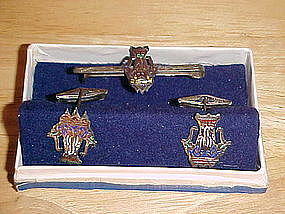 Each cufflink is signed A & Z 1/20 12k G.F..
Vintage 1950's Men's tie bar. 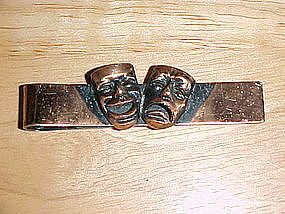 This tie bar is made of solid copper and features the famous COMEDY & TRAGEDY masks. It measures 2 1/2" wide and 3/4" high. This classic 50's copper tie bar is in very good condition!!! Unusual hand made mens jewelry set. 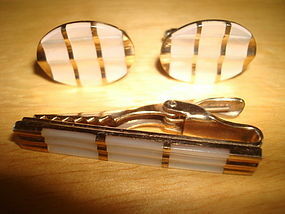 The set consist of a Tie bar and Cufflinks made of sterling silver and multi colored enamel. This set was crafted in SIAM in the 1930's - 40's. Each piece is signed " SIAM STERLING." 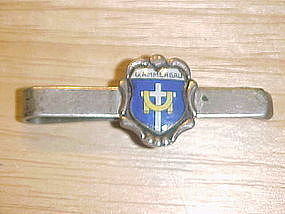 The tie bar measures almost 2" wide and 7/8" high. The cufflinks each measure 7/8" high. This set is in very fine condition!!! This is not your typical SIAM design jewelry that you usually see!!! 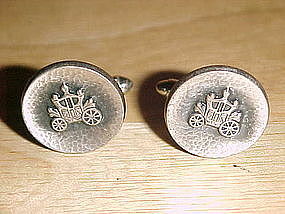 Nice pair of Hickok cufflinks from the 1960's. 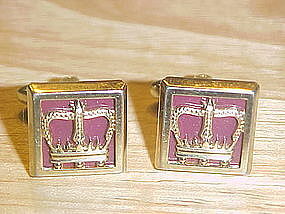 These gold tone pair of cufflinks each feature a Kings Crown frame covering a red tile background. The plaque measure about 1 1/8" x 1 1/8" each. They are each signed " HICKOK U.S.A." and they are in fine condition!!! 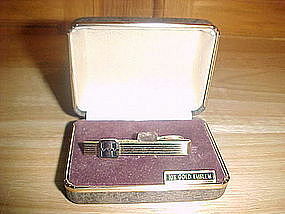 Vintage Men's Tie Bar/Tie Clip with original box from 1970's. The Tie clip is gold filled and has a solid 10K gold initial " H " plaque. 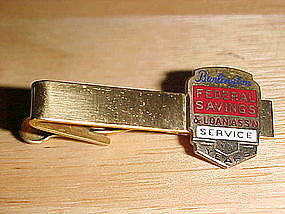 This tie clip was an employee award from the now defunct Harris Bindery of Champlain, NY. 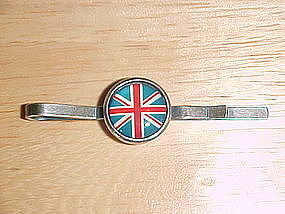 This tie clip is in Excellent unused condition and measures 2" wide. It would make a great gift for a Gentleman who has the letter " H " in his initial. 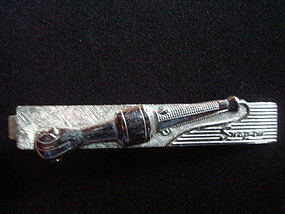 Wonderful 1940's vintage tie bar by " HICKOK." 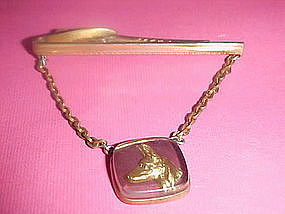 This tie bar has a medallion featuring a German Sheperd's head covered in Lucite. The medallion is suspended from the tie bar by two chains. It is in fine condition!!! 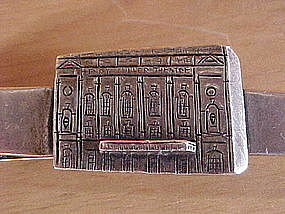 This tie bar measures 2 1/2" wide and is signed " HICKOK USA." 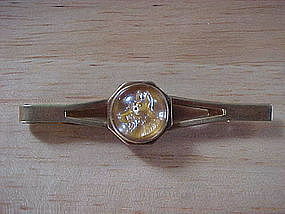 This fine vintage tie bar would be a great gift for the German Sheperd fancier!! !